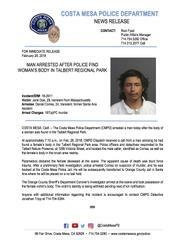 At approximately 7:10 a.m., on Feb. 28, 2018, CMPD Dispatch received a call from a man advising he had found a female’s body in the Talbert Regional Park area. Police officers and detectives responded to the Talbert Nature Preserve, at 1299 Victoria Street, and located the male caller, identified as Correa, as well as the female’s body in the brush area nearby. Paramedics declared the female deceased at the scene. The apparent cause of death was blunt force trauma. 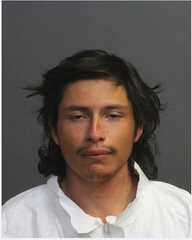 After apreliminary field investigation, police arrested Correa onsuspicion of murder, and he was booked at the Costa Mesa Police Jail. He will be subsequently transferred to Orange County Jail in Santa Ana where he will be placed on a no bail hold. The Orange County Sheriff’s Department Coroner’s Investigator arrived at the scene and took possession of the female victim’s body. The victim’s identity is being withheld pending next of kin notification. Anyone with additional information regarding this incident is encouraged to contact CMPD Detective Jonathan Tripp at 714-754-5364.